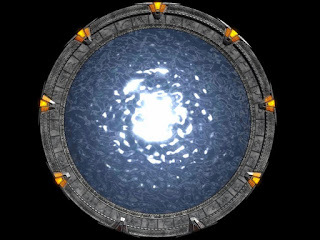 Strange Conspiracies: Is there a real stargate? Yes of course. The movie and the show "Stargate" i believe have a ton of truth to them. Stargate, if you watch SG-1 will bridge the gap between the Sumerians, ancient Egyptians, and the Mayan civilizations. The governement knows about inter dimensional travel and refuses to tell us the truth. We only have these clues in our television shows, and movies. If you look at the logo on Stargate SG-1 the series, you will notice that they wear a masonic logo on there uniform. Is this coincidence? Are the enlightened ones trying to tell us something? You be the judge. I believe we are being visited from other worlds. The truth is out there. We must find it! Here is a picture of the Gulf of Aden. There is a member of the navy from every country in this current location. This image shows a swirl in the water. No one knows what this object is. I believe it is a stargate. This stargate can probably send aliens from another galaxy into our own to start an interstellar war. This could be very bad. 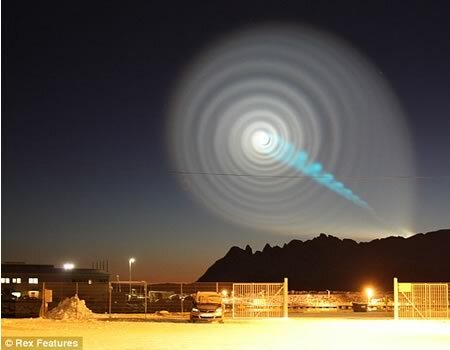 The picture above is a blue spiral light over Norway. Some people try to say this was a Russian missile test, i am not so easily convinced. Could this be a stargate into another galaxy? Is this a direct result of the LHC Collider? 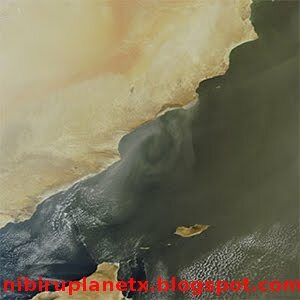 In that picture of the gulf of aden I don't see a swirl in the water, I see a swirl made of clouds...and the other picture can be done in photoshop...are you 100% sure that the pictures are authentic? where did you get these photos from ?